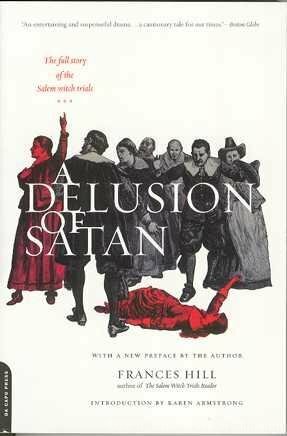 The subject matter of this book by Frances Hill (published 1995) is fascinating, and the tragic story of the madness that gripped Salem, MA in the late 1600’s has been researched impeccably. The writing style annoyed me a bit, though. I sometimes felt like I had been led into a confusing maze of personalities and dates and places and then left alone to find my way back out again. My 270 page, paperback edition has a few pictures and a family tree, but it could do with more to better clarify complex family interrelationships and, for an international readership, the geography and chronology of events. Still, there is no doubting the intelligence and compassion in Hill’s writing. I did feel from time to time that I was looking into a mirror as I read her insightful descriptions and analyses of these bizzare events – the product of familiar, all-too-human anxieties and fantasies. Thousands have been victimized in witch-hunts. Western Christianity, unlike Judaism, Islam, Buddhism, or Eastern Christianity for that matter, seems unaccountably obsessive and fearful about the devil and the powers of evil. Someone should write a thesis trying to find out why this is. Anyway, a good read. Made me think. ~ by Garry on October 8, 2011.